Can the perfect weekend getaway heal a deeply wounded marriage? The unhappy couple in THE ONE I LOVE search for answers to that question in director Charlie McDowell‘s tame debut. 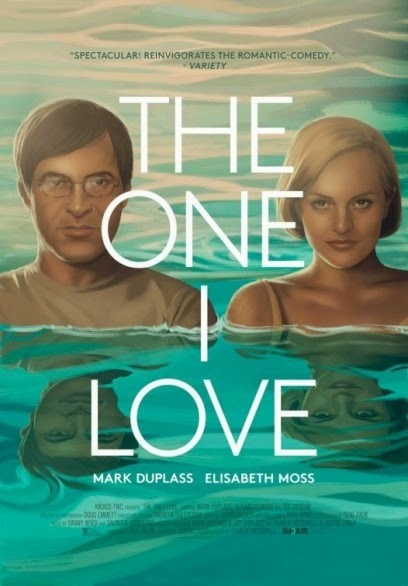 The story begins in a therapy session where Ethan (Mark Duplass) and Sophie (Elisabeth Moss) are looking back at what used to make their marriage work, as they recall events that have caused them to drift apart. With the aid of their therapist (played by Ted Danson), they try to mend the broken relationship and reach an understanding of what needs to happen for them to find happiness again. The therapist hands them a brochure detailing an idyllic Californian retreat and recommends the two spend a weekend in picturesque seclusion to renew their love and start over. Arrival at the private estate finds the pair spending the evening indulging in food, wine and weed as they attempt to rekindle whatever romantic flame still exists between them. The outcome of the first night is a strange one, and the next morning, Ethan and Sophie reveal contrary accounts of what happened. Were they that drunk and stoned that their memories of the night before were so clouded? Or was there a greater power at work here that could not be explained? The film takes a perplexing, Shyamalanesque turn at this point, leaving behind any rational or sensible meaning. However bewildering the film is, Duplass (THE LEAGUE) and Moss (Mad Men) both still manage to put in solid performances. The film focuses entirely on the relationship of their two characters, presenting a 90 minute display of their acting ability and range. Moss portrays a heartbroken, dejected and disconnected woman who, at times, is also an affectionate, cheery and spirited wife. Duplass contrasts his cold, straight-faced cynic with a good-humored, charming and engaging husband. The performances, however; do not save this confusing film. McDowell (son of actors Malcolm McDowell and Mary Steenburgen), rarely strays from filming the dull and unraveling relationship of Ethan and Sophie. We see a few shots of the gorgeous, mountainous California backdrop, but most of the shots are limited to interiors where the dialogue is typical and trite. There is a slow flow to the movie, an arc that McDowell underscores with a subtle, rhythmless soundtrack. The music makes a commendable attempt to improve certain aspects of the picture, but ultimately the varying scenes of domestic conflict and marital harmony result in a rendering that fails to captivate. This being his first screenplay, Justin Lader seems to have tried to write something resembling a Charlie Kaufman script. The bold and incomparable fantasy worlds that Kaufman created in films like BEING JOHN MALKOVICH and ETERNAL SUNSHINE OF THE SPOTLESS MIND were conceived in such an original way that the structure and dialogue were gripping enough to restrain the implausibility. THE ONE I LOVE fails to reach those standards, and this teaming of a first-time director and first-time screenwriter yields a puzzling and futile composition. 2 out of 4 stars.